At their dawning, civilizations are built on the power and ingenuity of the human spirit. 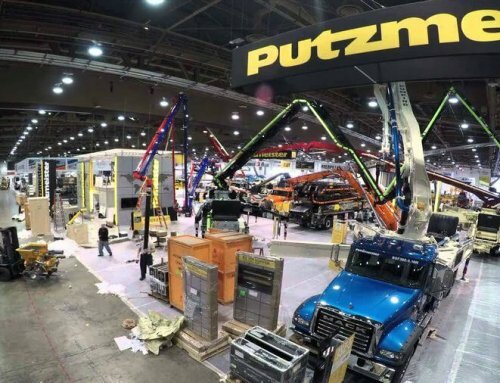 Monumental successes, hinging on the conveyance of goods and materials in the most efficient and versatile ways possible.Today, in the hands of globally respected manufacturer Putzmeister America, technology has enabled the methods of the past to evolve to a higher level. Contractors now have incredible options to broaden their horizons, and extend their capabilities to grow and diversify their businesses. That’s where Putzmeister Telebelt truly shines. A Putzmeister exclusive, the Telebelt truck-mounted telescopic belt conveyer is one of the most versatile material placement machines ever designed. Engineered to handled a variety of jobs more efficiently than other material placing equipment, Telebelts are ideally suited for jobs that [00:01:00] require high volume outputs, for fast and efficient placement. The ability to convey a range of different materials. The flexibility to deploy and operate on low clearance jobs. The convenience of moving to [00:01:15] multiple locations on the same site if needed. And quick setup and clean-up to perform more jobs in one day. Versatility, reliability, and efficiency. A Putzmeister Telebelt has it all. Full 360-degree rotation of the feeder and main belts makes positioning the Telebelt and ready-mix truck easy on a job site. Designed to convey a variety of materials, Telebelts work with both standard and specialty hoppers to enhance speed and efficiency on the job. The Rock Hopper, for example, handles stone up to four inches in diameter. The skid-steer loader hopper is used for gravel and sand. Offering even more convenience, the low profile hopper can transfer material from the coal chute door found on many dump trucks directly to the feeder. The side loading hopper makes it easy to load material on job sites, where access to the end of the feeder is restricted. All these hopper options make placing material on the job site fast and efficient. Saving time and labor, Telebelts can perform multiple tasks on the same site. A single unit can convey gravel, concrete, and backfill, all in the same day. They are perfect for the residential contractor. 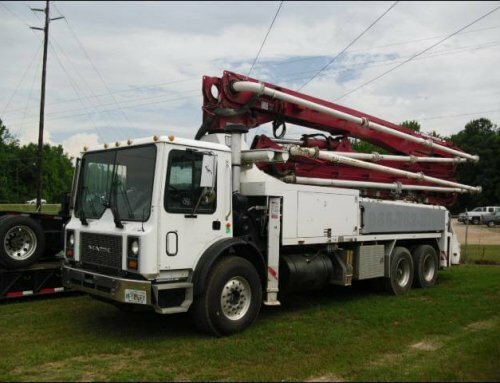 A Telebelt can usually complete these jobs from one convenient setup location, keeping material trucks at the curb, away from the foundation. But if a project is large, and requires moving the unit to complete the job, a Telebelt is designed to be able to move from one spot on the site to another, usually in under five minutes. That’s speed and versatility! But a Telebelt can be used for so much more than typical concrete and gravel placement jobs. With a little imagination and ingenuity, a Telebelt can place everything from mulch on a playground to sand for landscaping, rock for lining a riverbed and concrete for slope paving, to salt and other flowable materials. Sites with limited access, such as those with narrow doors, low ceiling heights, or long reaches, are no match for a Telebelt. Material can be conveyed at or below grade, even on slopes. Enclosed sites, with confined space and low overhead clearance, are an ideal fit for a Telebelt. Because Telebelts do not put material under pressure to convey them, jobs like highly scrutinized bridge deck pours are ideal for these machines. Telebelts eliminate concerns about concrete segregation and airing entrainment. They can also handle any slope requirement, in fact, Telebelts are about the only option when the job calls for mixes that cannot be pumped, such as pervious concrete. Riverbank and waterway lining is simple. Underground fuel tanks can be a challenging job. 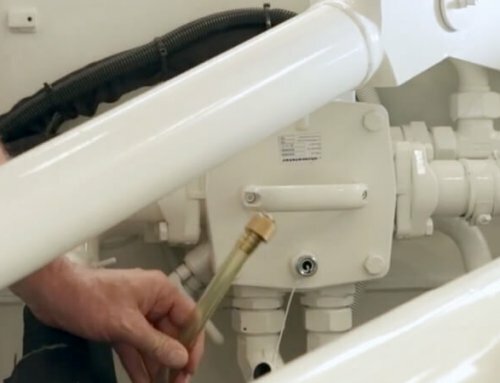 Once the fill under the tanks is completed, the operator can finish the job without a hose man being in the hole. Many sites restrict the use of equipment close to the pour. With their fantastic horizontal reach capabilities, Telebelts are excellent for jobs like drainage fields or filtration systems. 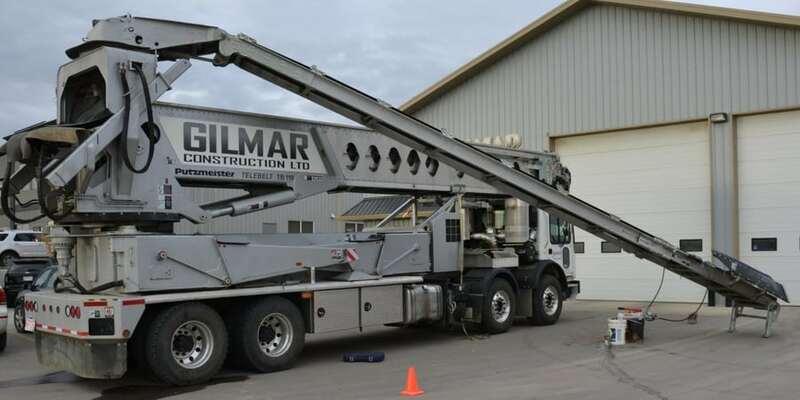 Large agriculture buildings, like animal containment facilities, go up quickly, with the Telebelt taking concrete as fast as the ready-mix trucks can deliver it. Proudly made in America, Putzmeister Telebelts are designed to provide many options for [00:04:45] placing all kinds of material on different job sites all around the world. Versatility in material, versatility in the type and location of jobs, and versatility in maximizing the productivity of your existing employees and material assets make a Putzmeister Telebelt in invaluable to your business. Offering more than equipment, Putzmeister provides classroom operation and maintenance schools and onsite training to support Telebelt owners and operators in the field around the globe. With every new Telebelt purchase, an expert field service technician will walk you and your employees through your Putzmeister Telebelt startup. Around the clock technical support, a parts inventory worth more than 35 million dollars, and a three-year 6600-hour pro-vantage warranty plan help ensure that your Telebelt investment won’t be eroded by downtime. Regional customer support and service centers provide warranty work and hands-on technical assistance and training. Contractors today must find ways to boost efficiency, sales, and profitability. A Putzmeister Telebelt is a great way to accomplish your company’s goals because they are designed with a contractor in mind. Putzmeister Telebelts can be put to multiple uses, achieve high volume outputs for greater productivity, setup and operate under low heights, operate efficiently at low horsepower or reduced fuel cost and noise on the job, and convey a wide variety of materials to help you expand your customer base. Broaden the horizons of your business!